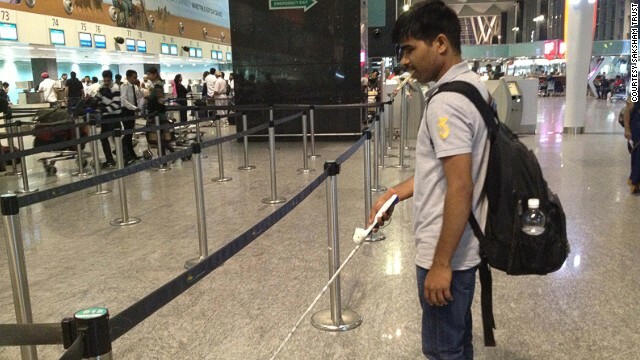 The "SmartCane" has been developed in India as a low-cost smart technology to provide independent mobility for blind people. 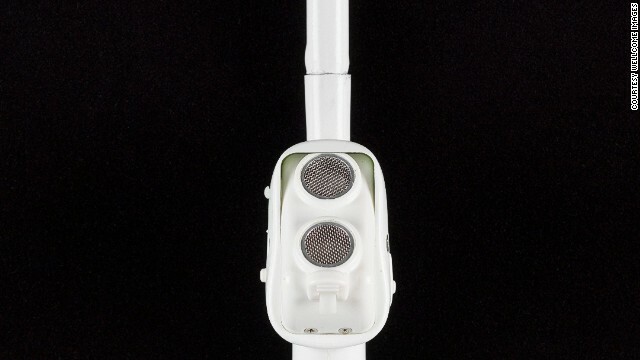 The device attaches to a standard white cane. 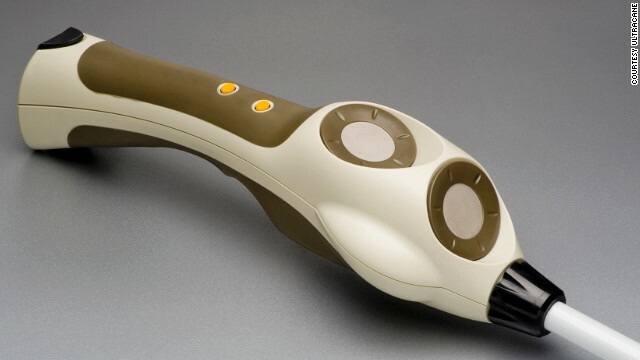 It emits ultrasound waves to detect nearby obstacles and vibrates to inform the user avoid them. The SmartCane is especially useful for identifying obstacles above knee height, which are hard to detect with a standard white cane. SmartCane users attend workshops to familiarize themselves with the technology before venturing out on their own. The Ultracane, made in the United Kingdom, is a similar technology but offers more precision. The Ultracane provides distance and direction detection to navigate narrow paths whilst avoiding obstacles. 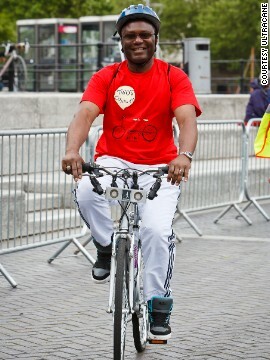 The UltraBike, created by the makers of the Ultracane, is a device that fixes onto the handlebars of any bike, for use on supervised cycle tracks. It contains two ultrasound sensors and has two arms that vibrate to inform the cyclist about obstacles and the boundary of the cycle track. Vital Signs is a monthly program bringing viewers health stories from around the world. (CNN) -- "On the streets the sidewalks are cluttered with street vendors, animals, streetlights and other obstacles which make them uncomfortable even for sighted people," explains Professor Meenakshi Balakrishnan, a computer engineer at the Indian Institute of Technology, in Delhi. 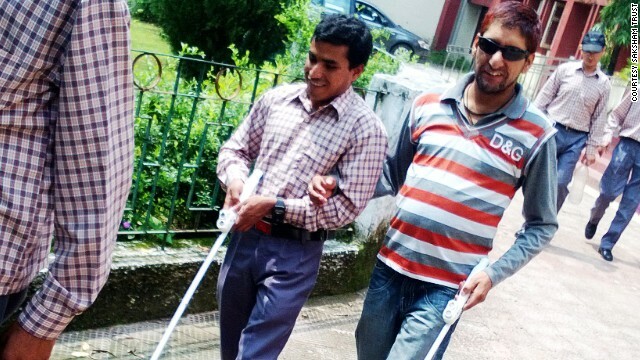 Balakrishnan heads the team behind the "SmartCaneTM," a new device using ultrasound to guide the visually impaired through the busy streets of India by building upon the widely used white cane. 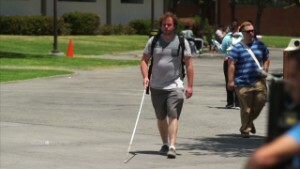 "A white cane is an excellent device, providing a lot of information to users," he says. "But it is poor at detecting obstacles that are above waist height and do not have a touch-point on the ground, such as a tree branches sticking out into your path." The team at SmartCane™ took on this challenge by copying the skills of animals such as bats, which emit sonar calls into their surroundings and use the echoes bouncing back from nearby objects to divert around them. 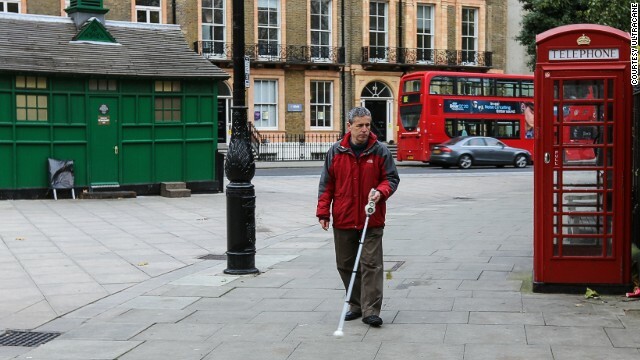 The smart technology version instead sends out ultrasound waves via a device attached to a standard white cane; it detects them on their return, and uses vibrations to inform users of any obstacles in their way. 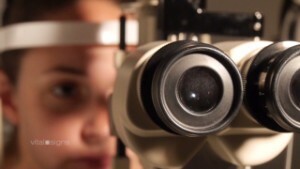 The real benefit comes from the ultrasound scanning a 45 degree span above the knee, providing information a regular cane simply can't provide. 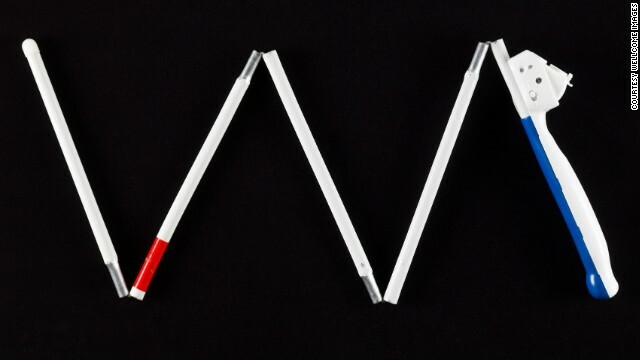 As people move the cane from left to right when they walk, vibrations detected on one side mean they should move towards the other. Differing patterns and intensities of vibration tell users the distance of the object obstructing their path, as far as three meters away. The SmartCane™ is not the first of its kind, with similar technologies existing in countries including South Korea, Taiwan and the United Kingdom, where the "Ultracane" has been available since 2011. "Ultracane provides narrow-beam accurate navigation that allows a skilled user to proceed at normal walking speed. It helps you to 'navigate your way' rather than simply 'avoid hitting things.'" explains Dr Paul Clarke, director of Sound Foresight Technology Limited whose Ultracane device provides information on the direction, as well as distance, of an obstacle when aiding the mobility of its thousands of users worldwide. But a retail price of over $1,000 places it firmly out of reach of many in developing countries. "The aim of the Ultracane is to offer blind and visually impaired communities a device that gives them independent personal mobility outside the home," he says. The company has recently unveiled an "Ultrabike," a device that fits onto bikes and uses vibration to provide greater freedom on supervised cycle tracks. "Under controlled and supervised conditions the Ultrabike gives blind and visually impaired people an opportunity to experience -- or re-experience -- riding a bike," says Clarke. The goal for Balakrishnan and his team, however, had been a low-cost technology to provide independence to the 15 million people estimated to be blind in India, where blindness is a national health priority. "We are targeting low-cost economies, starting with India," states Balakrishnan. "In high-income countries, footpaths are wider and fairly safe with few obstacles, but in India there are many obstructions meaning people who are visually impaired are reluctant to leave their homes." Retailing at 3,000 Indian rupees, which is just $50, the SmartCane™ recently completed trials with 150 users from across the country and is now available to buy. The challenge remaining is to find and reach the millions of visually impaired Indians, many of whom reside in the poorest and most remote communities. "There are 5 million people estimated to be blind who are of productive age and need independent mobility to work or go to school and be part of the mainstream," concludes Balakrishnan. "We are working through schools, hospitals and local NGOs, who are the groups with access to the people we need to reach." With a goal of at least 50 partners, including government institutions and local NGOs, the aim is to bring independence to all the visually impaired people not only in India, but eventually beyond the country to benefit other low-income populations. Read: Is this the return of the 'White Plague'? A 3-D printed exoskeleton is helping children with a rare neuromuscular disease. Artificial limbs made by 3-D printing are changing the lives of amputees in Sudan. A device for extracting water from air is being used by the military -- could it help developing countries too? Air pollution is now the biggest global environmental killer, but these high-tech solutions could save lives. TB is growing increasingly drug resistant -- and it's becoming a global problem. Ebola: Time for experimental vaccines? Nearly 40 years after Ebola was discovered, there is no cure. But could experimental vaccines protect people? Guinea worm disease once infected millions -- now it's almost eradicated. But can we catch the final cases? Scientists are bioprinting human body parts from ears to bones. Here are some the most impressive advances. A South African carpenter lost his fingers in an accident -- now he's making mechanical fingers and hands for others. Robot carers are helping elderly people, watching their health and keeping them company. Half the world is facing water shortages, so is it time for us all to start drinking recycled sewage?